Last fall, my husband was diagnosed with bladder cancer, and I thought my world had been crushed. I had recently retired from nursing, and was very much aware of the implications of bladder cancer. A nun friend of mine was going to the Holy Land, and I asked her to take a prayer intention for me and give it to a caregiver at a holy site. While she was on pilgrimage, my husband underwent surgery for bladder cancer (stage 2) and was prepared for the worst—from bladder removal, stents, and possible metastasis. I prayed Rosaries during his surgery. The surgeon finally came out with a smile, and I said, “Thank you, Mother of God, and my Lord.” He informed me that it was cancer and did not appear invasive. The pathology report confirmed it as non-invasive carcinoma. It is being followed every 3 months with cystoscopy for reoccurrence. He will undergo this procedure for 2 years. My husband and I were signed up for a pilgrimage to the Holy Land in May 2017 with Pilgrim Center of Hope; something I had long prayed that we would be able to do. A few weeks before our pilgrimage, I had a severe dizzy spell (vertigo) just out of the blue. I could not walk without holding onto something. My husband took me to the Emergency Room, where labs and scans were done. I appeared to be in good health, except for a significant thyroid nodule. After multiple needle aspirations to check for thyroid cancer, the results were inconclusive, unable to determine if it was cancer. I, for one, could not believe that both my husband and I could have cancer at the same time. I informed the endocrinologist that I was going to the Holy Land regardless. He agreed that would be fine and could follow up when I returned. I said, Jesus will figure it out, and I trust in Him. Upon our return from our pilgrimage, I ran into a friend of mine, an ENT surgeon. I told him what was going on, and he sent me to a pathologist friend of his to do the needle aspirations and biopsy. It was benign. Jesus took care of us again, as we trusted Him again. I often recall sitting by the Sea of Galilee in peace, praying and splashing water on my neck. It was a wonderful moment, because I felt at peace. After all, I was in the Holy Land walking in the footsteps of Jesus; our Loving Jesus and Great Physician. Since our pilgrimage, we have more peace, no matter what the circumstances. The mysteries of the Rosary are alive and more meaningful than ever. Family gatherings with our busy, married children have become more frequent and more special than ever. Yes, Christ heals today! But the greatest miracle is not bodily healing. Jesus reminds us that what is most important is our peace and union with God (cf. Mt 10:28). We often focus on our worries and wounds. Today’s saint, Augustine, directs our attention past these things, to Jesus: “Have confidence, you who are infirm. Such a physician has come, and you despair? Serious was the sickness, the wounds were incurable, the pain was hopeless. Do you consider the seriousness of the evil, and not the omnipotence of the Physician? You are despairing but he is omnipotent; those who made known the Physician and were the first to be cured are witnesses to this” (Comm. Ltr. Jn., 8,13). Jesus, come and heal me where I most need healing. Pilgrim Center of Hope Ministry of Pilgrimages – We invite you to see our upcoming journeys of faith. One place from our visit that is connected with the Blessed Mother is the Dormition Abbey. This Church is located on Mt. Zion in Jerusalem. It is believed to be the site of the home of the Apostle John. As we know from Sacred Scripture, from the cross, our Lord entrusted the care of his mother to the Beloved Disciple, John. It would be easy to believe that Mary lived here with John after the resurrection and ascension. Even though the greater tradition is that after Pentecost, John and Mary went to Ephesus and that Mary was assumed into heaven from there, there is also a lesser tradition that says that eventually, John and Mary returned to Jerusalem, and her Assumption took place in this location. So, dormition means ‘sleeping.’ One of the dogmas of the Church regarding our Blessed Mother is that she did not undergo death and the corruption of the grave, but rather fell asleep and was assumed into heaven and crowned Queen of heaven and earth. Besides Mary’s desire to lead us to her Son, there also exists a close association between Mary and the Holy Spirit. Mary and the Holy Spirit desire us to know Christ more intimately. They are constantly working so that we can all serve God, serve the Church, and God’s people with greater intensity and joy. As beloved disciples of Jesus alongside John, we receive Mary from Our Lord, to become our spiritual mother. Today’s saint, Pius X, explained, “Nobody ever knew Christ so profoundly as she did, and nobody can ever be more competent as a guide and teacher of the knowledge of Christ” (Encyclical ‘That Most Happy Day’ pp. 7). Prayer: Dear Mary, be my guide today. I need your maternal guidance. Guide my daily pilgrimage so that I always walk in the way of your Son, listen to the Holy Spirit, and live in the Father’s love. Amen. Would you like to take a faith journey that helps you grow closer to Mary? We invite you to see our Ministry of Pilgrimages’ upcoming dates. Even if we work in a secular environment, can our work actually be holy? The answer may surprise you. When you visit Pilgrim Center of Hope, you’ll notice that every room is named after a saint or holy person. We do this as a reminder that we’re always surrounded by, and supported by, our fellow members of the Communion of Saints. Our Work Room is entrusted to Saint Maximilian Kolbe, whose photo hangs on a wall with his quote, “Only love creates, only love triumphs.” He is sitting at his messy desk, writing with a pencil. In many cases, work is burdensome. But when God created humanity, it was not so! “The sign of man’s familiarity with God is that God places him in the garden. There he lives ‘to till it and keep it’. Work is not yet a burden, but rather the collaboration of man and woman with God in perfecting the visible creation.” (Catechism of the Catholic Church, no. 378) Only after sin enters the picture do we begin to see our work as a burden, instead of what it truly can be: a calling from God that allows us to collaborate with God in creation! When Father Max Kolbe returned home after a year of tuberculosis treatments, he saw that anti-religious sentiment and atheistic Communism were rising. In 1922, he responded by adopting the modern printing press to publish Knight of the Immaculate monthly magazine, which peaked at 600,000 copies per issue. In 1930, he arrived penniless in Japan with fellow Franciscan friars, and within a month was printing a Japanese version of the Knight. He soon began a daily newspaper (circulation 1,000,000). Numerous books and pamphlets were distributed freely by the friars. In addition to his printing ventures, Father Kolbe established “Cities of the Immaculate,” consisting of large numbers of Franciscan friars working in mass media. These friars were true missionary disciples; working boldly and with a sense of urgency in sharing the Gospel. Yet, not every job was obviously “Christian”: some friars manually labored at maintaining the press, others edited, researched, delivered, and still others cleaned up after everyone! The lesson of work: O Nazareth, home of “the carpenter’s son,” We want here to understand and to praise the austere and redeeming law of human labor, here to restore the consciousness of the dignity of labor, here to recall that work cannot be an end in itself, and that it is free and ennobling in proportion to the values – beyond the economic ones – which motivate it. We would like here to salute all the workers of the world, and to point out to them their great Model, their Divine Brother, the Champion of all their rights, Christ the Lord! How can we transform our work into something holy? How can it be, rather than a burden, a blessing? As Paul VI said, our model is Christ Jesus. In the tiny, backwater town of Nazareth, he spent thirty years learning, working for his foster father’s business. He adopted our way of life. By taking on the ‘burden’ of work with his own hands, God the Son transformed work back into a blessing; a way by which we answer our calling in daily life. Saint Maximilian Kolbe, pray for us. 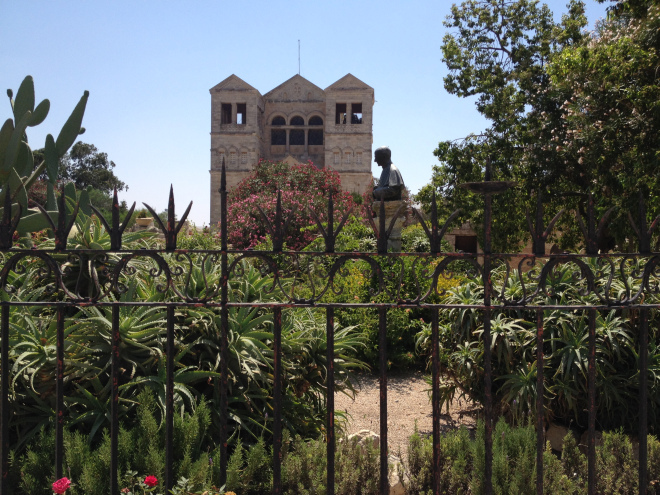 At the top of Mount Tabor, on the path to the Church of the Transfiguration, there is a canopy of sweet-smelling shady Eucalyptus trees that lead into a lush courtyard garden. Low and high stone walls topped with ornate iron work and cascading vines separate a patchwork of gardens full of a variety of plants and colorful flowers. 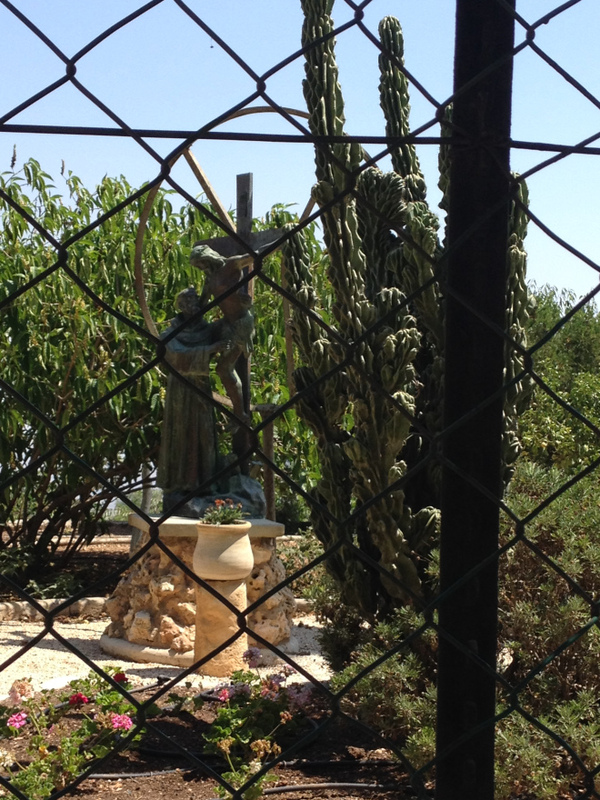 Statues and garden objects dot the landscape, the most magnificent being the life-size statue of Christ on the cross bending down towards St. Francis, whom He made custodian of His Holy Land. Did you know that the month of August is dedicated in the Church’s calendar to the Immaculate Heart of Mary, recalling the Virgin Mary’s desire to serve God in his ongoing plan to save us? As we begin this special month, we share with you the testimony of Norma Garza. In 2011, Norma journeyed with us on pilgrimage to Marian shrines. It’s totally different than going on vacation. Being a pilgrim, you feel like you’re going on a retreat – but it’s an extended retreat, and you have to realize that you’re with other people. You can learn from the other people, and hopefully they learn from you. Also, you’re there for a different purpose: to increase your faith, to see things in a different light. It makes me want to cry… My relationship to Mother Mary has brought me to a place where I never would have been before, because Mother Mary takes you by the hand and she shows you her Son, personally. My relationship with Mother Mary just increased a thousand-fold by going to the places where she appeared, hearing her messages, and understanding why it’s so important for her, as a Mother, to take us to Heaven and to get us closer to Jesus. August 13 marks the 100th anniversary of one of Our Lady’s apparitions in Fatima, Portugal, in 1917. Pray the Rosary on this day, asking Mary to help you be an instrument of peace in the world. Marian Shrines Pilgrimage 2018 – Ask us about our next pilgrimage focused on growing closer to Jesus & Mary by visiting the places where she appeared in Lourdes and Paris, France, as well as Fatima, Portugal. Our Lady of Guadalupe Pilgrimage 2018 – Inquire about our next pilgrimage focused on growing closer to Jesus & Mary by visiting her famous shrine in Mexico City.